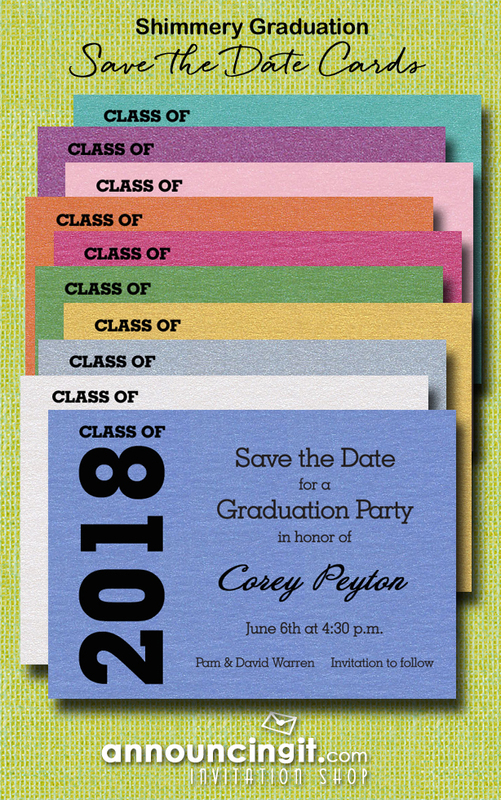 The best way to ensure a great turn out at your graduation party or graduation ceremony is to send guests Save the Date Cards. Remember that your child’s friends are also graduating and the dates for parties are limited and your guests – and your child – will probably be hopping from party to party for a couple weeks. Change to ANY YEAR graduation and choose any of our beautiful shimmery paper colors: blue, white, silver, gold, green, hot pink, orange, pink, purple and turquoise. When do you send Graduation Invitations? This entry was posted on Saturday, January 13th, 2018 at 12:35 am	and is filed under Adult Invitations, Graduation, Invitations. You can follow any responses to this entry through the RSS 2.0 feed. You can skip to the end and leave a response. Pinging is currently not allowed.